This morning I attended Kyle Christian Steele’s “Learn to Code: Scratch Program” where he explained the basics of coding and demonstrated how coding can be applied to many classroom concepts. Steele defines coding as “step by step instructions that tell a computer what to do,” and advocates students practice critical thinking, collaboration, visualization and perseverance through coding. 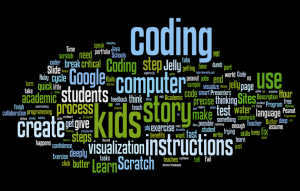 Steele recommends we use coding to teach students how to visualize content. For example, take an academic concept, such as the water cycle, and write a story or find a water cycle story online. First, students visualize the story and draw pictures or storyboards. Then, students animate their storyboards using Scratch, a free coding software developed by MIT. This process allows students to deeply consider the water cycle stages while learning coding skills with Scratch. Check out Steele’s presentation for more information (link coming soon) or email Emily Dittmann at edittmann@rsu1.org. Nicely written, Emily — I am looking forward to checking out the presentation link. 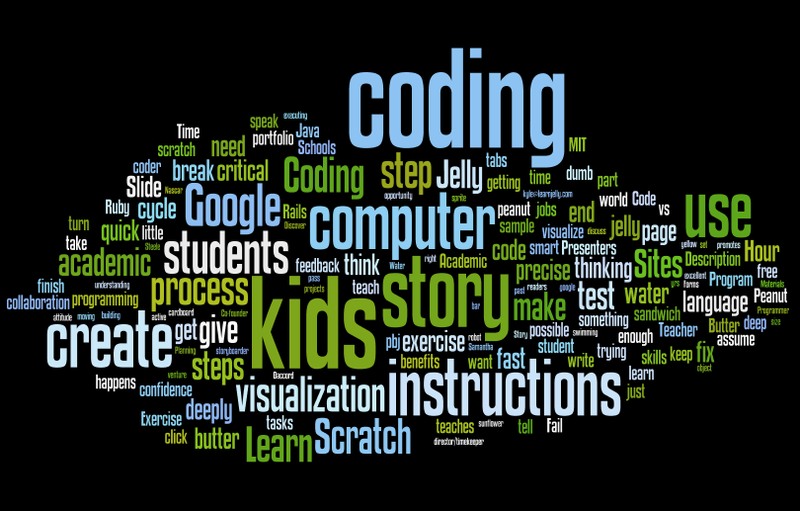 I especially like your word cloud…definitely using that idea for my next classroom presentation!